Freight brokers have a central role in the fast-paced transportation industry in the U.S. They function as the link between shippers and carriers, helping loads get moved more efficiently and rapidly. Are you considering opening your own freight brokerage business? If you have experience in the industry that’s great, but what should you do if you’re starting from ground zero? It may be tough for aspiring freight brokers to start operating in this rather complex field. You need a solid set of diverse skills and knowledge, ranging from communication and organization to marketing and sales, and encompassing legal and industry know how. If you’d like to jump straight into the list of the top freight broker training schools, you can click here. Otherwise, continue reading for general information regarding things you should consider when choosing a school. Do You Need Freight Broker Training? Achieving success in freight brokering, similarly to most other fields, requires thorough knowledge of the industry. By learning its intricacies, you’d be better prepared to handle the regular workflow, as well as the challenges on the way. While no training is legally required for freight brokers, many schools offer excellent programs to get you up to speed on the latest industry trends, technology, and best practices. These can really make the difference when it comes to how your brokerage initially performs when you open up for business, and whether you’ll be successful down the road. There are a number of options for receiving freight broker training, each offering a different set of skills and information. How you decide to go about learning will depend on your previous experience and needs. Still, one of the most popular and proven ways to get started in brokering is to attend a freight broker class or school. 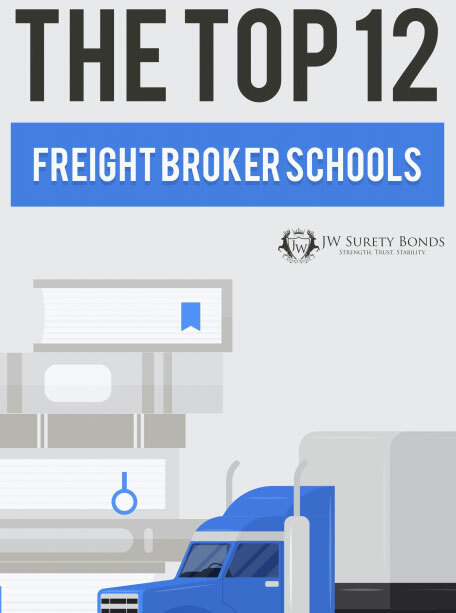 In order to read the full comparison and breakdown of each school, you’ll want to download our free freight broker school e-book. Besides separate online schools, some learning platforms offer freight brokering courses. This is the case with Udemy, which has a brokering class called Broker U. The Freight Broker Bootcamp is one of the well-known online options for freight broker training. While the website is a bit outdated, the information it contains is up-to-date and very useful. If you are located in the Southeast of the U.S., the Rapid Authority school may be a good choice for you. It offers short workshops on starting your freight brokering business, as well as licensing help services. Another good way to start your training in brokering is to attend the courses of the Freight Broker Agent School. You can attend the courses and workshops it organizes in Georgia and Florida. The Atex Freight Broker Training school is one of the good educational options for starting out as a freight broker. The website is a bit outdated, but it is information-rich. The Freight Broker Trainer school is led by the Transportation Training Group. The school offers training options for brokers, freight dispatchers, and oversize load pilot car operators. Taltoa has trained and consulted freight professionals for more than 20 years. The school offers training, placement, and consulting for freight brokers and agents. The Freight Brokers Course offers high-quality online logistics training which is accessible for budding brokers from across the U.S. The school also has freight broker training quiz apps (both iOS and Android), which may be quite handy for transportation professionals. The Logistics Academy was founded in 2015, but it has managed to establish a name for itself. The school offers affordable and diverse courses for brokers. The Freight Movers School is certainly one of the top names in training freight brokers and agents. It used to operate as the Transport Training of America, Inc. The Brooke Transportation Training Solutions is a well-known and established freight broker training school. In fact, it is the first result you will get if you search for “freight broker schools” on Google. Its website is modern, information-rich and user-friendly. A great option for your freight broker training needs is the Loadtraining Freight Broker School. You should start by reading the inspirational personal story of the founder David Dwindle on how he came to love his profession. It will certainly motivate your own efforts in the industry. Freight Broker Planet was founded in April of 2011, and has been improving their courses ever since. They have streamlined the delivery of crucial information within their courses, including the necessary interaction between facilitators and class participants, and the evaluation standards which encourage trainees throughout the learning process. Researching and comparing all of the different training programs and schools to find the right one for you is time consuming. That’s why we created a free comprehensive guide comparing the best freight broker training schools across the nation, which will allow you to find the one that best meets your needs. Our e-book also includes school discounts which are exclusive to users who download it. Download our free freight broker training e-book guide so you can start brokering loads effectively and grow your revenue. Is There Free Freight Broker Training Online? There are several free online resources that cover freight broker training and other important items required for becoming a freight broker (such as our “How to Become a Freight Broker Guide“). However, free online freight broker training resources shouldn’t be your sole source of training/information, but should be used in tandem with attending a quality training school program. There are many online and offline and on-location freight broker training schools to choose from. Online freight broker schools, such as Freight Broker Planet, can be very helpful, and are a great fit if you have a busy schedule/don’t have the time to commute to a school. On the other hand, on-location training schools can provide hands on training and more one on one attention. Whether you choose an online or offline school will depend on your preferences and personal learning needs. If you have opted in for an official freight broker training program, you need to carefully assess what your needs are. This is how you can make sure you will select the most appropriate course. It is important since you do not want to waste your time on learning things you already know. In the same time, you should not go for a program that does not teach you the core competencies that you will need as a broker. You should start your assessment of available training programs on the basis of an analysis of your current experience and knowledge base. Take time to revise what you already know and to outline the main skills you want to work on. Then it will be easy to see whether a freight school has something of value to offer you or not. Once you have identified your educational needs, you have to decide whether you can attend a course at a physical location, or will opt for a remote course. You can review the locations at which major schools offer their training and see if anything fits your plans. If there is no appropriate program in your proximity, you can consider an online course. Last but not least, you need to determine how much time you can dedicate to a training program, and what budget you can put aside for it. There are various options in terms of program length, as well as different pricing models. I’m very much interested in brokerage training and licensing. This could be the stat d something great. I’m looking into In-Classroom classes to get my freight broker license near the Orlando (FL) area. Please call at 321-278-1245 to provide me with details of your courses. We’re not a school ourselves, but we do offer a free e-book which outlines how to start a freight brokerage. I help Freight Agents find work after graduation and I’d like to know if by any chance you would be able to direct me to Agents in need of work? Would like information on grants for the classes. Or where to start looking. Your best bet would possibly be to contact the schools for that info. Please reach out to our freight broker school coordinator Kim at [email protected]. She should be able to help you.